Jean, an IFMGA-certified guide, takes you on this wonderful village-to-village ski touring trip in the high region of Svaneti in Georgia! Discover the unique and remote region of Svaneti in Georgia! Svaneti is a small region with impressive high mountains in northwestern Georgia. These spectacular peaks lie on the border with Russia. Today I want to invite you to a unique ski touring trip, from village to village, in this wonderful region in Georgia. Breathtaking views, spectacular mountains, medieval villages, steep slopes and thrilling runs make for an unforgettable ski touring trip in Georgia! Located in the heart of the majestic Caucasus Mountains, Svaneti -or Svanetia- is surrounded by the highest peaks of this range, with an altitude ranging between 3000 and 5000 meters. Starting from Tbilisi, the capital city, our ski tour will take us through the villages of Iskari, Mazeri, Mestia, Adishi and Ushguli. Nestled in the middle of breathtaking peaks, time seems to have stopped in these small medieval villages. This trip is a unique experience, a great opportunity to discover the authentic Georgia while enjoying an amazing skiing experience. You don’t need to have a high technical level to join me on this adventure. The terrain is suitable for classic ski touring. We do ask each participant to know how to ski on all type of snow. During climbs, you will always be in the company of the guide. However, you need to have a good fitness level. Very few people have the chance to visit this country, let alone cross from village to village. This is a truly exceptional trip! We will be skiing in the heart of the mountains. We are the only ones who can offer you to travel with a light backpack during the day. In the evening you will find all your belongings. We offer the experience of trips already organized in this region. Every year we explore new heights. We personally supervise all our trips, each year we offer several expeditions and ski trips in off-the beaten-path mountainous regions all over the world. If you want to enjoy a unique ski touring experience, just send me a request. Check the date below and join me on this amazing 10-day trip in Georgia! The price INCLUDES: Flight ticket between Paris and Tbilisi (possibility of leaving from a province, depending on availability)- Airport taxes - On-site transfers - Supervision by a French IFMGA certified mountain guide - Accommodation - On-demand loan of avalanche rescue equipment (ARVA, shovel, probe) - A collective pharmacy - Picnic // The price DOES NOT INCLUDE: Personal equipment, except for the specified above (see equipment list below) - Drinks and extra personal items in hotels and during transfers - Meal in Tbilisi (about 10/20 € the meal) - Insurance (repatriation, assistance, illness, accident, cancellation and interruption of travel, loss or theft of luggage, relief and rescue costs). The detail of this special items will be sent to you upon registration - Excess baggage and Ski registration.// Flights to Tbilisi can be operated by one of the following companies: Turkish Airlines, Ukraine International, Lufthansa. If we choose another airline, you will be informed beforehand. During the ski days, we sleep in the villages at local's homes. We sleep in heated houses with Persian rugs. MEALS: A cook is with us constantly. Armenian cuisine is hearty, varied and plentiful. In the mountains: hearty picnics prepared by our cook. Meals in Tbilisi are not included. Tbilisi has two types of climate: in the west, it is a rather humid and warm subtropical climate, without a dry season. The average temperature in Tbilisi is 13.5 ° C; to the east, it is rather Mediterranean. -Valid passport, for at least 6 months beyond the date of return for French, Belgian or Swiss nationals. For other nationalities, inquire at the Consulate or Embassy. -No visa required for French, Belgian or Swiss nationals. For other nationalities, ask at the Consulate or Embassy. -The prices shown are only valid for certain booking classes on the airlines serving this destination. They are therefore likely to be modified in case of unavailability of seats in these classes at the time of booking. -The program above can be modified according to hazards inherents to the trip. I have been a mountain guide since I was 25 years old. My passion for discovering the mountains of the world has led me to the four corners of the earth. Currently, I am also an instructor at the National School of Skiing and Mountaineering (ENSA). Each year, I organize different trips. I'm in charge of each trip's organization and I'm sometimes also the guide who leads the group. It could either be me or one of my 4 guide friends, who I have been working with for years. I have been organizing trips around the world for the past 26 years: Alaska, Antractica, Nepal, Mongolia...Over the years, I have organized trips in more than 30 countries. I am currently based in Chamonix and the other 3 guides who work with me live nearby as well. 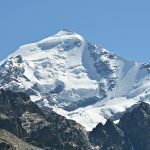 If you are interested in traveling far away or discovering the Mont Blanc massif and other places in the Alps, for climbing, ski touring or ice climbing, please contact me. It will be a pleasure for me to organise a trip that meets your expectations. we needed to got north of Teheran, as Zagros had not enough snow. But otherwise perfect!